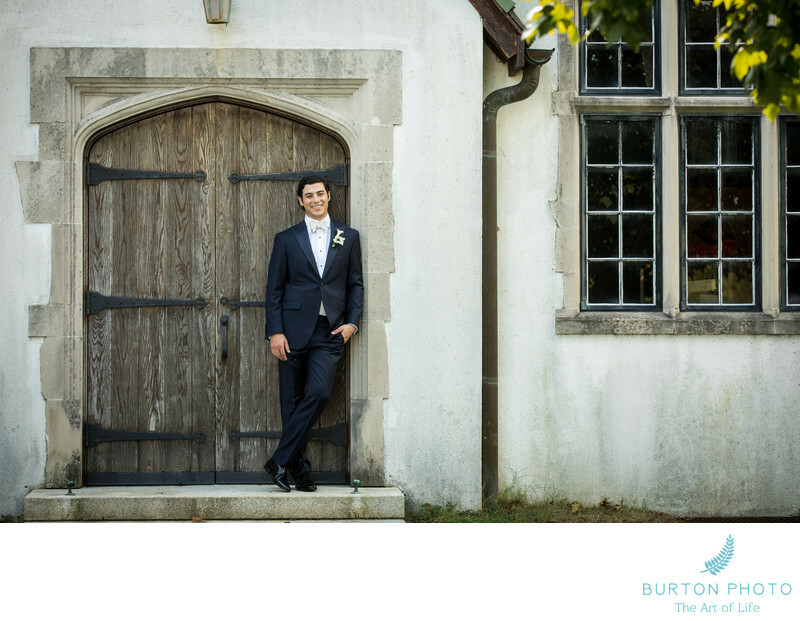 As an important part of our wedding day photography, we create a portrait of the groom as well as a portrait of the bride. We found the perfect spot to photograph David, just outside the original Chapel that is over 100 years old. It was a hot, steamy, September afternoon in the Piedmont of North Carolina on David and Callie's wedding day. Luckily, we had a bit of shade from a large oak tree to give us some shelter. We took about 15 minutes creating portraits of David and his groomsmen, then beat a hasty retreat into the air-conditioning. It was worth the effort! I love this composition with David looking so happy and relaxed. Reynolda Presbyterian Church is very well known in the community and special to Callie and David. Reynolda Presbyterian Church was built over 100 years ago because Katherine Reynolds wanted a church where the people who lived and worked on the Reynolds Estate (Reynolda) could worship together. She had a vision for the Chapel and brought together the talents of Charles Keen, the architect, and Nicola D'Ascenzo who designed and built the stained glass. A half century later, a beautiful organ was built by D.A. Flentrop in the new sanctuary which was added to the original chapel.